All warning labels must comply with government regulations to avoid potential liabilities. 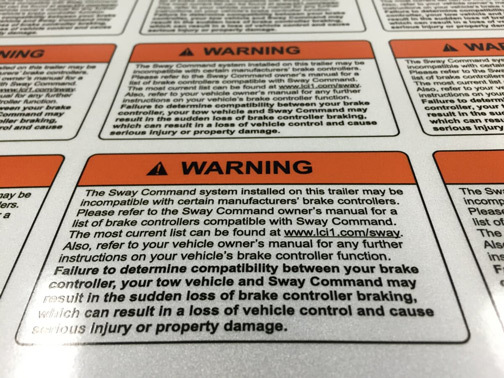 We’re happy to help you create up-to-spec custom warning labels featuring your graphics and information specific to your company. Warning labels aren’t just for industrial items. They’re also important for many consumer products. These warning labels contain the Dos and Don’ts for individual goods, thus raising awareness about risks and accidents that may arise if the product is misused. Warning labels are a must for all medical products, machinery and equipment items, chemicals and cosmetics. Our digital printed warning stickers and labels are available in a wide range of shapes and sizes. We can even produce them using multiple types of materials that need to be specific to application, end use, temperature requirements, removability options etc. They’re specially engineered for visibility, important for workers in industrial environment or public places and need to recognize warnings immediately. Choose self-adhesive, removable stickers or permanent ones, made for outdoor or indoor environments alike. We’ll even create these labels and stickers for extra protection against abrasion, smudge-proof, weathering, and chemical corrosion. Ask for the availability of multiple options for the end use of your labels. Depending on application uses, warning labels, stickers, and decals vary significantly in terms of colors. The colors used on these labels need to correspond to a specific application, to stay consistent and not confuse workers. For example, under the ANSI code, warning messages need to be orange, while red color indicates danger. We provide ANSI & ISO Compliant Safety Labels. Warning labels are commonly seen on electrical appliances, vehicles, as hazard labels on consumer products, chemical labels, destructive labels, security labels, and as freezer labels for cryogenic engineering. At Multicolor Labels, we digital print several types of removable labels, caution stickers, and warranty void stickers. Increase your company’s work safety and hazard awareness with high quality, full-color custom warning labels. Contact us for more information on our custom quotes and low minimum short runs.